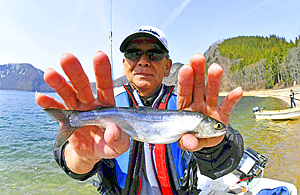 KANEYAMA, Fukushima － Amateur anglers flocked to Lake Numazawa in Kaneyama, Fukushima Prefecture, in early April when a four-year ban was lifted on fishing for kokanee (see below), the lake's specialty. The ban was imposed following the 2011 disaster at Tokyo Electric Power Company Holdings Inc.'s Fukushima No. 1 nuclear power plant. The resumption of fishing brought smiles to the faces of those who had been working to that end and to the recreational fishermen who had gathered on the day fishing resumed. Anglers came not only from neighboring areas but also from outside the prefecture. "We've waited for this day for a long time," one angler said. A large number of people came to the lake, which is known as the prefecture's only habitat for kokanee, and were absorbed in fishing from early morning. "It's so good to see so many anglers coming," said a smiling Shigeru Suzuki, 66, the head of the Numazawa fishermen's cooperative, who decided to lift the fishing ban. Kokanee fishing in the lake, which began in the Meiji era (1868-1912), has a history of more than 100 years. As the population of the fish does not greatly increase through natural breeding, the fishermen's cooperative has been spending more than \1 million a year to collect their roe, hatch them and release 100,000 to 190,000 juvenile fish into the lake. Such efforts began before the 2011 Great East Japan Earthquake. The expense was covered by fees for commercial use of gill nets and fees for recreational fishing. The earthquake and the ensuing accident at the nuclear power plant forced the cooperative to ban kokanee fishing in April 2012. If the ban had been prolonged, the community could have lost the local tradition. Levels of radioactive cesium in the kokanee of the lake have been below the government-set threshold of 100 becquerels per kilogram since August 2014. "We are concerned about negative rumors about Fukushima products possibly spreading, but we want to keep offering kokanee to many people," Suzuki said. Anglers have also been looking forward to the lifting of the ban. A 71-year-old recreational fisherman from Tochigi Prefecture caught more than 50 fish on the day the ban was lifted and said with a smile: "I've been longing to fish for kokanee here. I'm so happy the ban was lifted." The town of Kaneyama has been using kokanee as a tourism draw through such ways as making kokanee burgers and preparing the fish as oshizushi (pressed sushi). However, the local fishery industry now faces the challenge of finding successors because some fishermen who had been catching kokanee with gill nets have retired due to old age and for other reasons. The members of the Numazawa fishermen's cooperative jointly conduct gill-net fishing while intensifying efforts to nurture successors. Yuichi Meguro, 57, a chief director of Okuaizu, a group of local companies that have been working to attract tourists with oshizushi and other specialty dishes, expressed concern. "We need a lot of fish in the tourist season in autumn," he said. A small sockeye salmon that does not migrate out to the sea but spends its entire life in freshwater such as lakes. In Japan, this fish is mainly found in Hokkaido. The high-quality fish is known for being the tastiest member of the salmon family, with less of a fishy odor and more of a deep, rich flavor. After the 2011 disaster, an inspection conducted by the Numazawa fishermen's cooperative detected 202 becquerels per kilogram of radioactive cesium in kokanee taken from Lake Numazawa, which exceeded the government-set threshold. The cooperative, therefore, banned kokanee fishing in 2012. It lifted the ban this year after the fish's radiation level fell and remained below the threshold.